Another quiet day. . . This handy tool, the household pet, we ply with skill and speed; and in the modern kitchenette it’s really all we need. The shining tool that opens cans makes household work a joke; it supersedes the pots and pans, the stoves that used to smoke. In olden times the toiling wives were always on their feet; they wore away their weary lives preparing things to eat. They fried the meat, they baked the beans, they cooked the spuds. They had no time for magazines, for euchre, or bridge whist. How fortunate the modern wife, with many a leisure hour! For she can fill with glee her life, and languish in her bower. And when at evening comes her man, impatient for the eats, she say, “I’ll open up a can of beans or deviled beets.” It takes three minutes by the clock to get his meal in shape; he’s so well trained he doesn’t balk, or try to make escape. It may be, as hand over hand, he throws the victuals in, he signs for grub that isn’t canned, that doesn’t taste of tin. It may be that his vagrant mind recalls the old-time steak, the dishes of the good old kind his mother used to make. But idle are the man’s regrets, and vain his hopes and plans; this is the age of kitchenettes , and things put up in cans. Posted on November 4, 2014 November 3, 2014 by SherylPosted in OtherTagged family history, genealogy. Well, that’s certainly interesting…. ! Interesting. 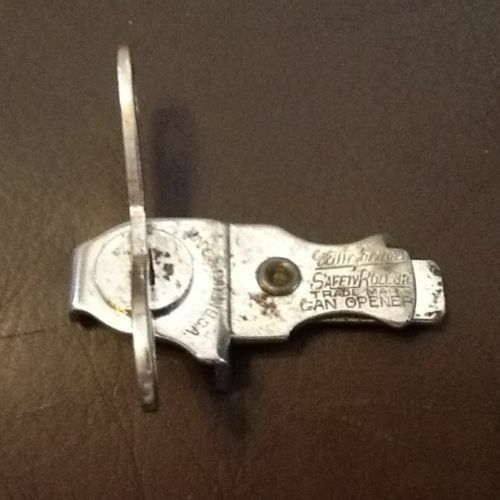 I have a friend whose family member actually took the hand held can opener to the next level opening the door to the many varieties that exist today. It sounds like you have a very creative person in your family. I’ve always admired inventors. Poetry that rhymes is the only kind I like, and this is clever. If Keats had been born later, he would have had more targets for an ode, methinks. That the can opener still exists in this form reminds me that many inventions evolve to near perfection. It really is amazing that some designs are nearly perfect. Great choice! Could Walt Mason be related to Mason jars? Hmm. . . I have no idea whether the author was one of the “Mason jar” Masons’. Great choice with the microwave, Tracks. The main thing that’s changed about them is the price. The first counter-top model was introduced in 1967 with a price of just under $500, which in today’s dollars would be $3,500 in today’s dollars. I looked it up. Wow, it’s amazing how much they’ve come down in price. It’s interesting how prices decrease as technological innovations become more mainstream. For example, I think that I paid about $80 (in 1970s dollars) for my first basic 4-function calculator. Today, one with similar capabilities would only cost a couple dollars. I love this poem! And haven’t we come a long way? I still keep a manual can opener and even have one like in the photo. I also still use a manual can opener. It works–and it take up very little space in a kitchen cabinet drawer. Now why didn’t I realize I could throw a can of beets at hubby in 3 minutes? I’m sure he’d love that . . . . It would be interesting to know more about Walt Mason. I remember those can openers. The new sort with handles are much easier to use. But spare me the electric can openers. They’re entirely too much trouble — at least in my opinion. Tip of the day: when no one can find a can opener of any sort, a screwdriver and a rock will do the trick. It takes a little while, though. #B tip of the day: any of the larger swiss army knives can open a can too. It’s on the flat-tip screwdriver. The bonus is in the arm exercise.